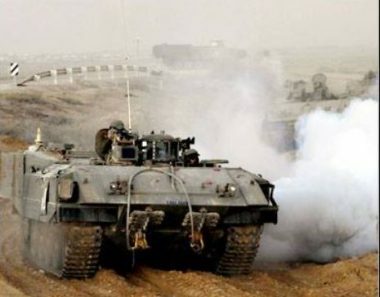 Many Israeli military vehicles invaded, on Tuesday morning, Palestinian agricultural lands, east of the al-Qarara town, northeast of Khan Younis, in the southern part of the Gaza Strip, and uprooted them while firing live rounds. The WAFA Palestinian News Agency has reported that at least three armored bulldozers and three tanks left the Kissufim military base, across the border fence northeast of Khan Younis, and advanced approximately 100 meters into the farmlands. WAGA added that the soldiers bulldozed some sections of the invaded lands, especially near the border fence, and installed sand hills, while firing many live rounds at random. The invasion is part of ongoing violations carried out by the army against the Palestinians in the besieged and impoverished coastal region.